With total student loan debt in the United States now over $1.5 trillion, students have to be prepared to pay off those student loans when they graduate. Knowing your available repayment, forgiveness and tax options will not only help you manage your student loans effectively—it may also save you money. Many students fail to look into their repayment and forgiveness options, which can hurt their ability to pay off their loans on time. On top of this, some students don’t realize how private student loans differ from federal aid. To help you understand your student loans, here are some of the most important things to know. Interest accrues while you’re in school. When you take out an unsubsidized federal student loan or a private student loan, interest will start accruing as soon as the loan is disbursed. This means that although you can usually defer repayment until after you leave or graduate from school, the interest you owe on the loan will start to build up while you’re in school and will continue accruing throughout repayment. When you graduate, you will be responsible for paying off the interest accrued and your total loan amount. There are multiple federal student loan repayment options. Federal student loans have several repayment options. Upon graduation, you’ll be automatically enrolled in a 10-year standard repayment plan unless you opt for an income-driven repayment plan. With one of these plans, your monthly payments will be based on a percentage of your income, and your loan balance will be forgiven after 20 to 25 years of repayment. Private loan repayment options are limited compared to federal student loan repayment. Private student loan repayment options are a bit different from federal aid options. Generally, private lenders don’t base your monthly payments on your income. Instead, you will choose a loan term, usually between five and 20 years, with a monthly payment based on paying off your balance and interest by the end of your term. There are no forgiveness options for private student loans. You may qualify for tax deductions or tax credits. You may be able to claim certain education tax credits or deductions if you’re in school or paying off a student loan. If you are still in school, you may qualify for the American opportunity tax credit and lifelong learning credit. And if you’re repaying your student loan debt, you should look into the student loan interest deduction and the earned income tax credit. Tax credits and deductions typically have income and filing status requirements, but if you qualify, you stand to save hundreds or thousands of dollars on your taxes. 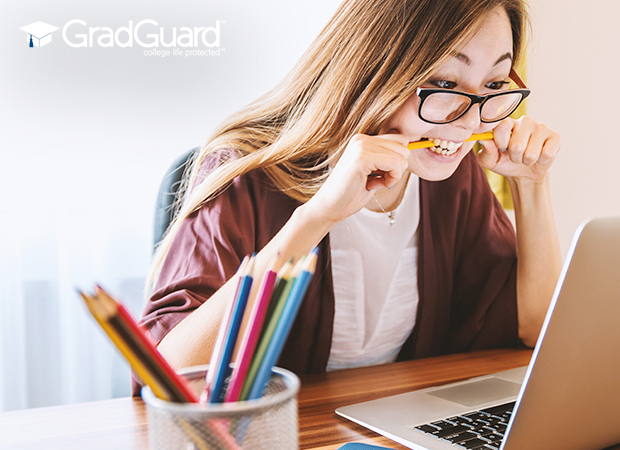 As graduation gets closer and those loans start to creep up on you a little faster, remember these financial tips from GradGuard to help you out!